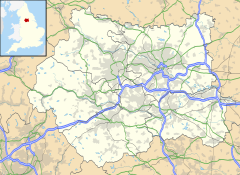 Silsden is a town and civil parish in West Yorkshire, England, on the River Aire and Leeds and Liverpool Canal between Keighley and Skipton, which had a population of 8,268 at the 2011 Census. Silsden was mentioned in the 1086 Domesday Book as "Siglesdene", and as the most important village in Craven. Generally an agricultural area, industry came with the canal and the Industrial Revolution. The town hosted a number of mills none of which now operate in their original form. There is still industry in the town, some in old mill buildings and some in a new industrial estate between the town and the river. The town retains some manufacturing. In 1911 there was a riot in Silsden when the police station was attacked. A very unpopular policeman had been too enthusiastic in his duties. Questions were raised in the House of Commons and it was reported in the national press. The policeman was removed from the town and no more trouble occurred. In 1998 a hoard of 27 gold coins dating back to the 1st century AD were found in the town and subsequently valued at £20,000 by experts appointed by the Department of Culture, Media and Sport. The Guinness Book of World Records reported that the biggest onion ever, at 14 lb (6.4 kg), was grown in Silsden in 2010 by Vincent Throup. However this has since been beaten. On 6 July 2014, Stage 2 of the 2014 Tour de France from York to Sheffield, passed through the town. The village is part of the Craven ward of the Metropolitan borough of the City of Bradford, part of the Metropolitan county of West Yorkshire. Silsden has been administered by the City of Bradford Metropolitan District Council since 1974. It also has its own town council. Silsden has four public houses: the Robin Hood, the Red Lion, the Punch Bowl, and the King's Arms. There are two members' clubs: Sunnybank Social Club and Twisters Social Club. Whilst Silsden does not have its own railway station, the Steeton and Silsden railway station is 1 mile (1.6 km) south in the village of Steeton. The station provides a link for commuters to the cities of Leeds and Bradford. Lying between Keighley and Ilkley, Silsden is served by buses to both these towns. Silsden's public transport benefits from Silsden being part of West Yorkshire rather than North Yorkshire, the border of which runs along one end of the town. The Lampkin family lived at Silsden during the Second World War. Lampkin brothers Arthur, Alan and Martin were, later, national motorcycle trials champions. Martin Lampkin won the 1975 FIM Trial World Championship and his son, Douglas "Dougie" Lampkin, is a twelve-time trials world champion. The Wainman family, a second motorsport dynasty from Silsden, compete in BriSCA Formula 1 Stock Cars. Frankie Wainman was World Champion in 1979, while his son Frankie Wainman Junior is one of the most successful drivers in the history of the sport. English rugby league player Jack Reed, who played for the Brisbane Broncos, was born in Silsden. Henry Price started his first Fifty Shilling Tailors shop in Silsden. With this fortune, the now Sir Henry Price, bought Wakehurst Place, Ardingly, West Sussex, which is now owned by the National Trust. Margaret Wintringham, née Longbottom, was a British Liberal Party politician. She was the second woman take her seat in the House of Commons and lived in Silsden when her father was the head teacher at Bolton Road School. On 27 April 1995, a one-off anthology supernatural drama titled Chiller aired, in which episode 6, titled "number 6", featured Silsden. Silsden was featured for almost the entire one-hour episode, using locations across the town. Bonaparte's Restaurant, on Kirkgate, was the subject of the first-ever episode of Gordon Ramsay's Kitchen Nightmares in 2004. After the show aired, Bonaparte's owner Sue Ray threatened to take legal action against Ramsay, Channel 4 and the programme makers, Optomen, after claiming that the show put her £400,000 in debt. Christine Hall, producer of Kitchen Nightmares, refused to accept the blame, stating Ray only had herself to blame. The programme revisited the restaurant in the second series, but Ray would only talk to Ramsay off-camera. In June 2006, Ramsay won a High Court case against the London Evening Standard, which had alleged, after reports from Ray, that scenes and the general condition of Bonaparte's had been faked. Ramsay was awarded £75,000 plus costs. Ramsay said at the time: "I won't let people write anything they want to about me. We have never done anything in a cynical, fake way." In July 2007, the butchers ,barbers and shoe shop located on Bradley Road were used in an episode of ITV's The Royal. ^ "Town population 2011". Neighbourhood Statistics. Office for National Statistics. Retrieved 22 February 2016. ^ Ekwall, Eilert (1960). The concise Oxford dictionary of English place-names (4 ed.). Oxford: Clarendon Press. p. 442. ISBN 0-19-869103-3. ^ Daily Mirror 10 April 1911 "Mob attack police station"
^ "Onions | Food and Travel Magazine UK". foodandtravel.com. Retrieved 10 April 2017. ^ "John Liddle's blog". Silsden--A Living History. 6 October 2012. Retrieved 10 April 2017. ^ "Craven". 2010. Retrieved 28 January 2014. ^ "Arthur Lampkin Sr. obituary". Yorkshire Post. Retrieved 11 August 2012. ^ "Obituary: Frank Wainman Farmer and dealer". Yorkshire Post. 17 December 2004. Retrieved 10 April 2017. ^ "A man and his millions". Bradford Telegraph and Argus. 6 October 2000. Retrieved 10 April 2017. ^ Dewhirst, Ian (14 September 2013). "Headteacher gave ungrudging service". Keighley News. Retrieved 10 April 2017. ^ "Chef Ramsay wins £75,000 damages". BBC News. 20 June 2006. Wikimedia Commons has media related to Silsden. silsdenbuzz.co.uk - Local Community Website and info. silsdenafc.net - Silsden AFC website.